The basic stances practiced in those martial arts which do include them in training vary little from one school to another. This tutorial presents a few generic stances which can be practiced both by martial artists and anyone else interesting in improving lower body strength and stability. View as PDF, or as web page. This 15-page richly illustrated tutorial covers basic-level kick techniques, and covers all you need to know to become a practitiioer. 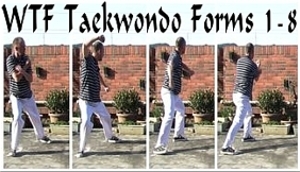 It can be used to complement training in any kick-oriented martial art, to supplement knowledge of kick techniques for those learning arts which don't include kick techniques, or just as a keep-fit regimen. View as pdf. The wire beater and iron rings are items used in Chinese martial arts to strengthen the forearms and shins. This tutorials gives a brief introduction to these two items and shows how they should be used. View as PDF, or as web page. This tutorial covers the first eight World Taekwondo Federation forms, or poomsae (coming soon). There are some martial arts-related articles on My Opinion Site; Living and Training in East Asia, Lost in Translation, and Well, Why Bother Then?